© Licensed to London News Pictures. 09/04/2014; Bristol, UK. 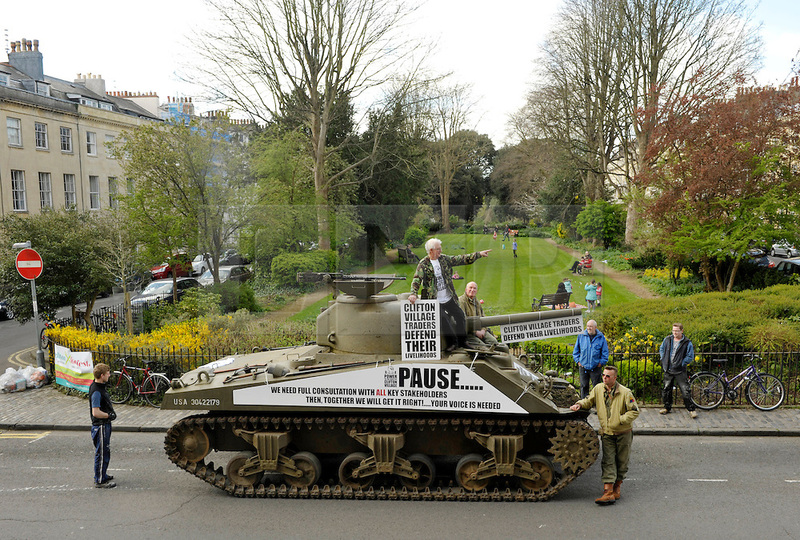 Tony Miles, (white hair and glasses) aka Smiley Miley from the Radio 1 Roadshow, rides in a WW2 Sherman tank through local streets in a protest by residents and traders from Clifton Village in Bristol about plans for a Residents Parking Scheme in their area from Bristol's elected Mayor, George Ferguson. They say the business and social life of the area will be hit very hard by the RPS with customers and visitors unable to park, and that some businesses will have to close or move away from the area. The tank is a symbol of defending their area against RPS.